This film depicts the social problems and the constraints presented to a society in transition. The story is of a young Muslim girl falling in love with a young Jewish boy. Being that their romance is deemed unacceptable by societal standards, they face trouble. The film is highly controversial due to the religious differences and causes many political and ethical discussions worldwide. Boutouba, Jimia. "The Moudawana Syndrome: Gender Trouble in Contemporary Morocco." Research in African Literatures 45.1 (2014): 24-38. Project MUSE. Web. 28 Mar. 2015. Hirchi, Mohammed. 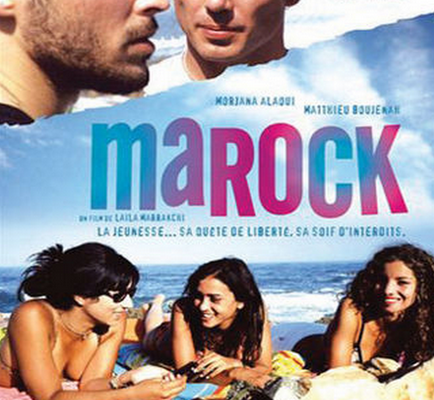 "The Ethics and Politics of Laila Marrakchi’s Marock." South Central Review 28.1 (2011): 90-108. Web. 1 Apr. 2015. Powers, H. "Yto Barrada: Tangier's Changing Cosmopolitanisms." Nka Journal of Contemporary African Art 2011.28 (2011): 130-39. Project MUSE. Web. 1 Apr. 2015. Kosansky, Oren, and Aomar Boum. "The “Jewish Question” In Postcolonial Moroccan Cinema." International Journal of Middle East Studies 44.03 (2012): 421-42. JSTOR. Web. 8 Apr. 2015. Edwards, Brian T. "What Moroccan Cinema? : A Historical and Critical Study, 1956-2006." Choice Reviews Online 47.07 (2010): 47-3688. Project MUSE. Web. 8 Apr. 2015. Green, Mary Jean. "Introduction: Cinema In and Out of the Maghreb." South Central Review 28.1 (2011): 1. Project MUSE. Web. 8 Apr. 2015.